Our membership class used to be on a Sunday after church. It was just an hour or two, but it made for a long day. In the class, a few pastors would share about our church, and we’d do our best to teach the material and answer some questions. Often, however, the whole thing felt rushed. Often I could tell that someone wanted to ask follow-up questions, but at the same time, he didn’t want to be “that guy”—you know, the one who keeps people at a meeting even longer, a meeting that’s already too long. And it wasn’t just getting through all of our information that made the class rushed. We, as pastors, also wanted to get to know the people in the class, just as they wanted to get to know us. Yet there just wasn’t much time for this either. Let me put it like this. It was as though we were all at a restaurant to enjoy a good meal with good company, but then we looked at our watches, realized we were out of time, and we had to go. So together, we scarfed down our food and left—a little unsatisfied. Now, we have slowed things down. Now, the membership class lasts four weeks. During the first three weeks, we cover topics that we think would be helpful to you as you consider what it might mean to join our church. We cover topics such as the meaning of the Gospel, our church’s history and structure, and our denomination’s core theological beliefs. This may not seem very important—but trust me, it is. Let me tell you why with a little story. I have a brother who started attending a church in the Midwest with his family. At first, things seemed great. They liked the pastor, the worship was engaging, and the people were friendly. And so they stayed. But as time went on, they began to have questions about the theology of the church. After a year and a half at the church, my brother told me, “You know, Benjamin, I don’t think we would have stayed here if we had known upfront what this church was about.” The church wasn’t teaching anything heretical, just off center a bit, at least from my brother’s perspective. This put them in a place where they had to make a hard decision: stay, continuing to invest with people they now considered family, or leave, following their theological consciences only to start over somewhere else. We don’t want this to happen to you. We care about you. This membership class, and this book, are expressions of that care. Of course, we believe this is a good church, a good place to worship God; that’s why we’re here. But you’ll need to decide that for yourself, and the best way for you to make that choice, we believe, besides participating in our weekly worship services, is by going through this class. In addition to your learning about us, throughout the class, we hope to learn about you as well. That’s especially what the last week is about. On Week 4, there is no “material” per se; we dedicate all of the time in class for you to take turns sharing some of what God has done in your life. This will take place among the people that you’ve sat at the same tables with throughout the class. For some, perhaps even you, this sharing about what God has done in your life sounds like a scary thing. But it shouldn’t be; we’ll do our best to prepare you for it. We may have a lot going on, but we want you—in fact, we need you—just as a healthy family needs all of its members. 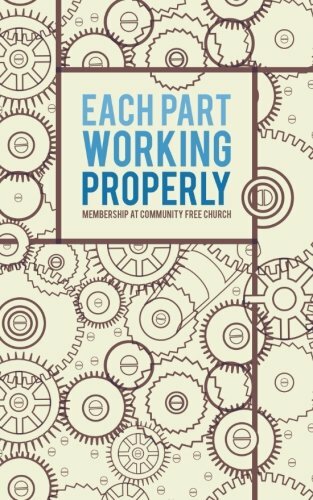 Because through the power of the Gospel, “when each part is working properly” (Ephesians 4:15), God builds his church in love.